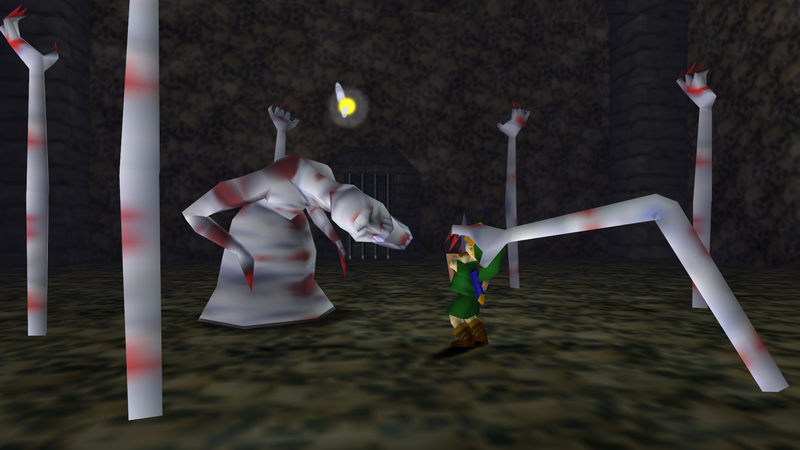 Daily Debate: What was Your Scariest Moment Playing a Zelda Game? It’s the day after Halloween, and I am not ready to move on. I don’t care that my favorite holiday is over – I’m going to keep the ball rolling! Let’s talk about all things horror in The Legend of Zelda! Why? Because, for a series often classified as “action/adventure” and “fantasy,” it sure holds its fair share of creepy moments. Taking the Mirror from Yeta in Twilight Princess? Nope. Passing Redeads in Castle Town in Ocarina of Time? Absolutely nope. “?? ?” in Majora’s Mask, with that gross bony hand that comes out of the toilet in the Stock Pot Inn? I suddenly feel don’t need to use the bathroom anymore. Here’s your paper, man. Yet, to me, there is one moment, one thing that stands above them all. The one that actually made me scream profanities in complete shock and terror, then walk away from the game with a dramatic, “Nope, nope, all aboard the nope train!” In the bottom of the well in Ocarina of Time. With that twisting, contorting face straight out of the Scream franchise, atop that misshapen body, and all those disembodied hands that grab at you if you come too close… I will never, ever forget that moment I first saw Dead Hand, and when he first latched on and refused to let go. Stuff of nightmares, man. I bet Link didn’t sleep for days. So, help me keep the creeps alive just a little longer, before we all descend into the next holiday craze. What was your scariest moment playing a Zelda game? Regale us with your horror stories in the comments below!